Thank you for choosing Two D’s Diving and Tour Adventures where you can experience Cozumel by land or sea whether you like to scuba dive, snorkel, sightsee or beach time. We specialize in customized and private tours. Two D’s Diving & Tour Adventures has been helping Cozumel tourists explore and capture the beauty that Cozumel has to offer. 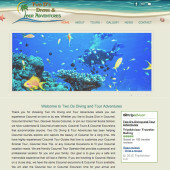 We have highly experienced tour guides that enjoy showing off their island. We are a friendly Cozumel tour operator that provides a personal and professional service for you and your family. Our goal is to give you a safe and memorable experience that will last a lifetime.